Allan H. Simmons, ed., Joseph Conrad in Context. Cambridge: Cambridge University Press, 2009. £60. xxxvi + 284 pp. 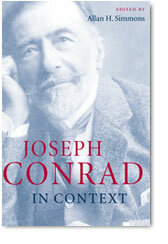 This review-essay is available in .pdf format (Acrobat Reader required): Jeremy Hawthorn on Joseph Conrad in Context.